Very lightweight, delicate, and tight. Setup: If you wish to guy it out properly, it takes longer than most tents. A single fiberglass pole slides through the sleeve pretty easily. corner guys in foot box. Another reviewer commented that the mesh rests on your feet so the bugs can still bite. True. You may be able to sew in an eye for an additional guy line to elevate it or a grommet so you can put a small "pup" style stick in to hold it up. Stability: Works fine. If there was ever enough wind to blow it over, you wouldn't need it in the first place since there would be no bugs. Weather Resistance: The floor is impermeable, but it does not have a bathtub bottom. Rather, it is flush with the ground (see pic below). Would be nice to have an inch lip minimum so as if you were using it in conjunction with a tarp, it could still keep above any streaming water. Ventilation: Full screen top so it vents well. 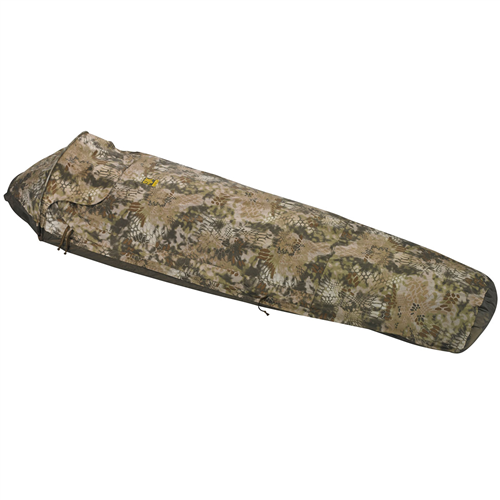 Room and Storage: This is a very tight fit for a bivy, even by bivy standards. I tried to read a book in it and it was nearly impossible. I had to hand hold the book above me. Half of the book was pushing hard against the screen. I was worried that the book's corners were going to punch holes in the no-see-um mesh. 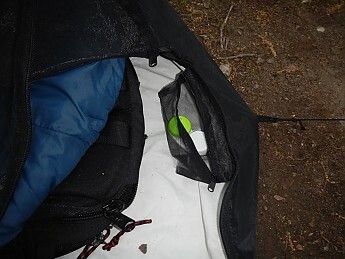 There is a tiny contact/keys pocket at the head of the bivy (pic). Packability: Packs down nice and small (pic). 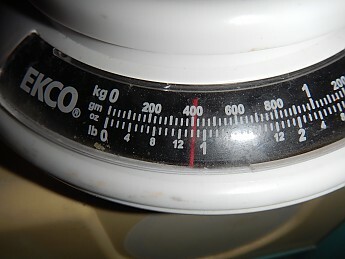 Weighs 14.5 oz. That's a feather. Ease of Use: If you put the pole in, but don't stake it down with a guy, the top will fall. 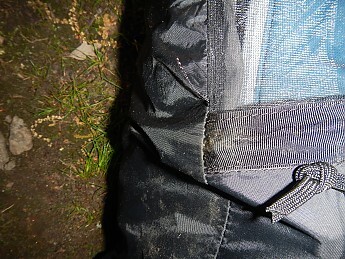 Really hard to slip into and out of because you can't be rough with it like a military grade Gore-tex bivy or you'll tear out the guy seams or the mesh screen. Features: It's a pretty basic bug net with a waterproof bottom. There are a couple of straps that are supposed to keep your mat in place. Construction and Durability: The mat strap popped off and took some of the waterproofing from the floor with it. It's such a tight fit, that any mat is not going to have wiggle room anyhow unless you use a 1/2 mat (which I do on lighter trips). The pole has no caps on the ends (pic). The pole sleeve is not reinforced at the end (pic). 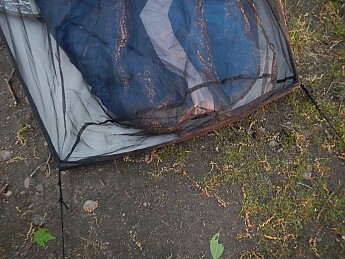 I am always nervous when I am trying to undulate into the bivy when night comes, that I will tear out guy points. Haven't yet, thank goodness. 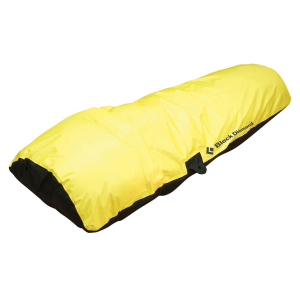 I have used this product in conjunction with a Gore-tex bivy. 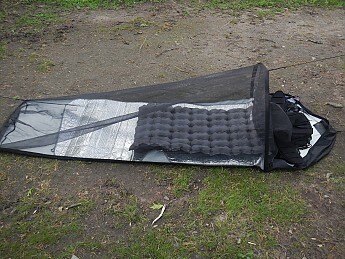 If the weather is good, I just use the bug bivy. If it rains, I throw on my Gore-tex bivy but hang the bug bivy over the top of the Gore-tex bivy head area. 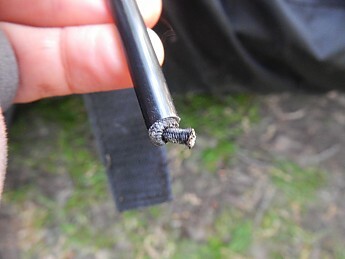 This keeps the water off of the head of the Gore bivy. This combo is lighter than a tent but still offers more warmth than a tarp and bug bivy. Seems like it'll be a good option for me when I go out to the coast. A nice breeze can go through, but without the bugs. I wouldn't mind if the footbox had a small pole too. I'd be too nervous that I'd accidentally rip the delicate material/seams. Thanks for the review, Jesse! Is there any benefit having this over sleeping with a bug net over your face? 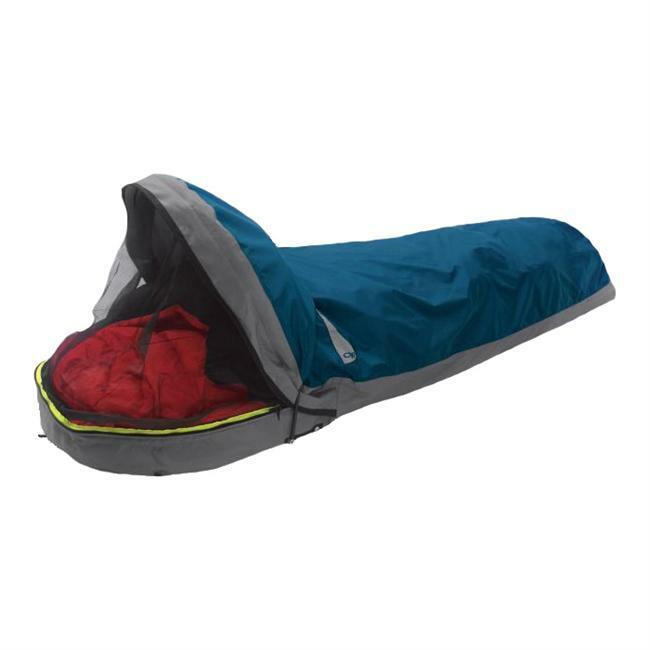 If you want to lay on top of your sleeping bag on a warm night or just unzip the side of your bag (which I do on most all summer outings. I also like to be able to read before I go to bed. It's tight but does keep out the bugs. Also, the bottom is impermeable. With a bag, you might need a plastic sheet under you. A bag with netting might be lighter though. 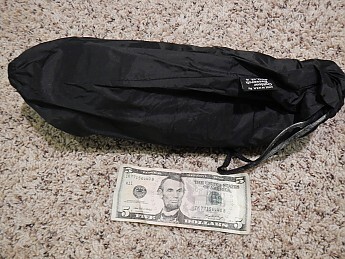 I've been looking for a lightweight alternative to all the small tents on the market, but a conventional bivy sack is still a poor compromise: in good weather, being encased in a limited-breathable fabric is overkill, and in bad weather, you need a tarp or something covering the entrance, so you can get in and out of the bivy without soaking everything. I have found a better alternative. 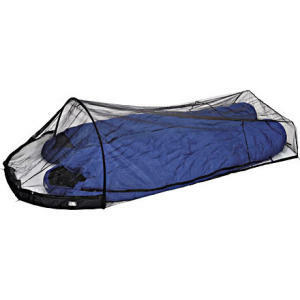 The OR Bug Bivy (available at Mountain Gear) is entirely mesh with a waterproof bottom. It's so light I got the double wide for the extra room. 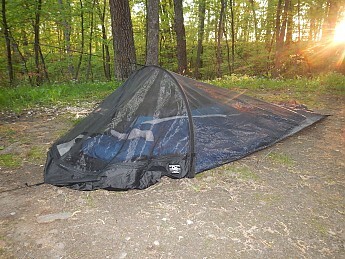 It weighs nothing, keeps the bugs off you, and offers the same ventilation as sleeping under the stars. I take a 14 oz. Integral Designs tarp for rain, and have a system that weighs under two pounds, but is extremely versatile.